Racial tensions are high, politicians are encouraging xenophobic behaviour, bigotry is dominating the headlines… and there’s a whole lot happening in Zootropolis, too. Much has been made recently of the overtones that Disney has implanted into their latest animated feature, their 55th overall, about racial stereotypes and how they can easily dominate people’s better sense of judgement, and while they are indeed present in the film, they also come at a time when they are all too sadly relevant once more. With everything from police brutality towards African-Americans to Donald Trump’s hate-speech rhetoric against Mexicans and Muslims to even diversity crises in the film industry after the whole #OscarsSoWhite fiasco all over the news as of late, Zootropolis could not have come at a more convenient time, when the world needs a reminder that it’s 2016 and we need to be more open-minded about people of different genders, races, religions, nationalities, and everything else if we’re to progress as a species. Because as it stands right now, an animated bunny and fox duo are far more civilised than any of those bigots put together. 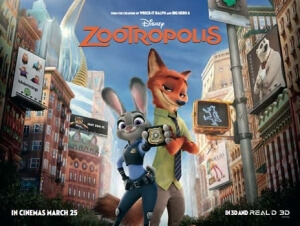 Said bunny and fox are Judy Hopps (Ginnifer Goodwin) and Nick Wilde (Jason Bateman) respectively, both of whom live in a world entirely dominated by animals, and when the former arrives in the extended city of Zootropolis to become the first rabbit cop on the police force, she must team up with the latter, a streetwise con artist, to solve a case involving several missing animals, all of whom happen to be listed as predators. This is when it gets into the far heavier themes of racial profiling and fear-induced stereotyping, and it will hit you like a ton of bricks when it eventually does find its way into the spotlight (which is more times than you would think). No spoilers, of course, but be warned: things will get emotional, and we’re not just talking about tears either. The stroke of genius about Zootropolis, however, is that even when it starts hitting you on the head with its all-encompassing messages, you find yourself still being extremely invested in the story, the characters, the humour, and especially the world that the animators have created, because they are all fun and lovable enough to make you truly care about what’s happening between the lines. The story may be of another mismatched pair forced to solve a crime together, but the mystery surrounding it all is really intriguing and even unpredictable in places; and said mismatched pair not only work really well together but also are strong and likable characters in their own right, ones that you won’t feel guilty about wanting to succeed all the way through. It’s also got a fun supporting cast, among them a giant buffalo police captain voiced by Idris Elba (naturally), Shakira as a popstar gazelle – which works more than you’re probably thinking – and the breakout star from the promotional material: a slow-moving sloth named Flash that perfectly works at the DMV – all of whom seem to be having a blast and being extremely memorable and enjoyable for both children and adults to remember fondly once it’s all over. As well as often being very funny and even self-referential (prepare for animal puns of past and even future Disney titles galore, as well as a very knowing name-drop of one particular earworm of a musical number), the very world that has been crafted by truly gifted animators is extremely creative and inviting, in addition to being well thought-out and presented with such pride by directors Byron Howard (Tangled) and Rich Moore (Wreck-It Ralph). An early sequence takes us right through each district that the city has to offer, from the sandy dunes of Sahara Square to the icy landscapes of Tundratown right through to a Rainforest District and beyond, and each one gets more and more inventive with each new reveal; we guarantee that on repeat viewings there will be things in the background or even the foreground that you missed the first time, making this perhaps the smartest-looking animated film since Inside Out or even The LEGO Movie. Above all, however, Zootropolis is a film that the world sorely needs right now, for all the right reasons as well as all the wrong reasons. We are seeing so many instances in the real world right now where racism and general bigotry is everywhere, and it will sadly never fully go away no matter how much we want it to, but if this film is in any way prophetic then it can at the very least be contained as tightly as possible by generations both old and new that end up being touched and moved by a warm-hearted and funny movie like this. We can only hope that Zootropolis and its all-too-timely message can at the very least dissuade supporters of the current political rhetoric raised by people like Mr. Trump – and given its current box office success in the US, it’s definitely spreading as widely as it can – because right now, Disney has more common sense than the current favourite for the Republican nominee, and that’s seriously saying a lot. Zootropolis is not just a wonderful family film that packs a great deal of humour, intriguing story, lovable characters and an incredible world design into a satisfying running time, but also a powerful and timely message that is sadly all too relevant in today’s culture of bigotry and xenophobia.